Although it is commonly stated that gunpowder was invented by the Chinese, it is certainly more true to state that it is a substance whose origins are lost in the mists of time, and that it has been subject to a series of technical improvements over the centuries to meet the requirements of the day. The Chinese don't seem to have been acquainted with guns because, according to Brock, they were astonished by their first sight of artillery on visiting Portuguese ships at Canton in 1520. Names associated with the early history of gunpowder include Berthold Schwarz, a thirteenth century Franciscan monk, who is reputed to have invented the principle of the gun in about 1320, and friar Roger Bacon, born at Ilchester, Somerset, in 1214. He left cryptic writings which have been translated to show the use of sulphur, saltpetre and charcoal mixtures to produce explosions and sparks. However, his proportions of 7 parts saltpetre, 5 parts charcoal and 5 parts sulphur would have been no more powerful than the fizz of a Roman candle firework, and I don't see how he could have made an explosion with it. My childhood hobby was making fireworks, and I can vouch for the difficulty of making a good bang with such crude mixtures. They will, however, propel a projectile from a gun barrel, and guns were used at the battle of Crecy in 1346. The crude ingredients would have been mixed on the battlefield because, otherwise, the three ingredients would have partially separated out during a bumpy journey. In those days it wasn't possible to make a really strong gun barrel. The blast furnace, with its readily available supply of molten metal for casting, was not invented until Tudor times. Iron, which was available in relatively small quantities, was made in a bloomery furnace, which didn't melt the metal, but produced an impure lump, weighing a few pounds, which had to be hammered into bars, squeezing the impurities out. The early guns were made very like wooden barrels, with bars welded together by hammering, all held in place with metal strengthening hoops. They had large bores so that they could fire heavy projectiles at relatively low speed. The development of gunpowder as we know it today would have depended upon the parallel developments in metallurgy. Crude mixtures of the three ingredients are, today, only used for pyrotechnics. Very good rockets can be made using 13 parts saltpetre, 2 parts sulphur, 2.5 parts fine charcoal and 2.5 parts coarse charcoal, compressed in a stout tube around a former which gives a hollow cavity up the centre, and confined with a clay orifice to allow the pressure to build up. The composition of proper gunpowder developed with time. Baptista Porta reached approximately the modern proportions in 1515. Typically, European manufacturers used saltpetre 75 parts, sulphur 12.5 parts and charcoal 12.5 parts, all, of course, by weight. The ingredients would have been of high purity, and the charcoal would have been obtained from alder, dogwood or willow, although charred straw was used for brown gunpowder. Sodium nitrate, "Chile saltpetre", was sometimes used instead of potassium nitrate. It was cheaper than saltpetre, and made a slightly more powerful product, although it tended to absorb moisture from the air. It was used to blast the Suez Canal. To understand the manufacture of gunpowder it is necessary to consider the factors which favour rapid combustion. The three ingredients are solid, relying on each other to supply fuel and oxygen. Clearly, the finer the particle sizes of the three ingredients, and the closer they are to each other, the better the mixture will function. That is why modern gunpowder undergoes the process of incorporation in a mill, like the 18th-century one at Chart Mills, or the 20th-century one at the Oare Gunpowder Works, both in Faversham. This process reduces the ingredients to a very small particle size. The resulting 'mill cake' is then broken up into chunks before it is pressed, typically in an hydraulic press with a pressure of about 70 tons per square foot, though originally screw presses similar to those still used by bookbinders were used. This compacts the particles, resulting in "press cake", about five eighths of an inch thick, which has a density of about 1.7 times that of water when dried. There is an optimum density, the rate of combustion decreasing beyond that point. Having obtained this material, it is necessary to regulate the speed of combustion for various purposes. This is done by converting it into granules. When gunpowder burns, it does so from the surface, the flame rapidly propagating throughout the particle. It is a physical fact that the larger a particle is, the smaller its surface area will be compared with its mass (weight). For example, a sugar cube of 1cm side has an area of six square cm. If eight cubes are stacked to make a large cube with 2cm sides, its area will be 24 square cm, while it weighs eight times as much. The ratio of area to volume is 6 for the single cube, but only 3 for the big cube. A cube of gunpowder the size of a sugar lump would, therefore, burn roughly twice as fast as a cube with sides twice as long. From the press-house the "press cake" is taken to the corning house, where the powder is automatically sieved into grains of different sizes, according to the application. Next, it goes to the dusting house, where powder dust is removed by centrifugal force in "reels", gauze-covered drums revolving in sealed housings. The dust can be recycled. The powder is then taken to the glazing house, to be polished in revolving drums, and glazed by the addition of graphite powder. This makes the particles less likely to absorb damaging moisture. It also makes them slippery so that they easily run into all the space into which they are put. Finally they are dried in "stoves" at 40 deg C till their moisture content is 1% - just enough to prevent them disintegrating into useless powder dust. Typical gunpowder looks like black granulated sugar. It is very easily ignited by a spark, but it won't burn if it gets damp. It is relatively insensitive to mechanical shock. Gunpowder made by the corning process wasn't any use for the very large and long range guns which were used in the second half of the 19th century. The use of good quality wrought iron and steel, the introduction of the principle of loading from the breech end of a gun, instead of down the muzzle, and the introduction of rifling, transformed gunnery, and hence required new types of gunpowder. At the time of Waterloo, cannons still used cannon balls, and they had very limited accuracy. Using a cannon was very much like playing snooker, for the gunner used ricochet effects to bounce the cannon ball along a line of defence, killing as many people as he could. Much effort went into designing fortifications to minimise this effect, which resulted in forts having complicated polygonal shapes. All this ended with the introduction of rifling in cannons, from which an elongated projectile was fired spinning like a top. These flew much trued than cannon balls, and it was possible to hit targets at long range. However, their direction of bounce was unpredictable. Things changed about the time of the Crimean war (1854-56), when the French used rifled guns fired from armoured floating batteries. In 1858 they launched an ironclad warship, "Gloire", mounting rifled guns, which threatened to make the British navy redundant. This caused a rush to re-arm with rifled muzzle loaders, which needed very large grained gunpowder. For these, the press cake was cut into strips, then into cubes, to form cubical or pebble powder. The sides of the cubes were usually 0.6 or 1.5 inches. Unfortunately, these gave a very rapid build-up of pressure, which accounts for the bottle shape of guns of that time, the breech having to be very thick to withstand the pressure. A certain General Rodman had a brainwave which enabled this problem to be overcome, as follows. 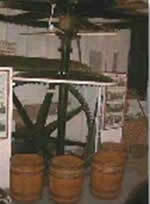 A prismatic moulded powder was made by pressing incorporated powder into moulds using hydraulic pressure. This gave prisms which would have a hollow cavity 0.4 inches across through the hexagonal block. Typically, each grain would be 1 inch high and 1.3 inches across. When these burned, the surface area on the outside would decrease as the combustion progressed, while the surface area of the internal cavity would increase. This caused a much more even rate of combustion than could be achieved for solid particles of powder. There were two grades, prismatic black, made with wood charcoal, and prismatic brown, using straw charcoal. It was possible to regulate the pressure much more evenly as the projectile went up the barrel using prismatic powder. The idea was first adopted by Russia in 1860, the British, as usual, being the last to take it up. The same principles are employed today for solid fuel rockets. Gunpowder will, in a confined space, build up a pressure of about 42 tons per square inch. The shock wave associated with the explosion can make the figure even higher. Typically, for a rifled breech loader gun of ten inches diameter, 250lb of gunpowder would be used to fire its 500 lb shell. A rifled muzzle loader would use about half that charge. Guncotton was invented in 1846, was almost five times as powerful as gunpowder, and didn't produce the dense clouds of smoke associated with the earlier explosive. In simple terms it is cotton wool steeped in a mixture of sulphuric and nitric acid. The first guncotton factory in the world opened at the Marsh Works, an existing gunpowder factory in Faversham, in 1847. However, the sophisticated manufacturing process was imperfectly understood and within a few months there was a very serious explosion which resulted in over 20 fatalities. Manufacture of the product in Faversham then ceased till 1873 when it was resumed on a different site at Uplees. It was only a matter of time before gunpowder became redundant for gunnery, and it was displaced by cordite, which is a mixture of nitro-glycerine, guncotton and petroleum jelly, about the end of the 19th century, although some Belgian forts still used gunpowder in 1914. Breaking rock in mines and quarries was a very laborious. Bronze Age man used antler picks to hack his way along mineral veins in the old copper mines on the Great Orme in North Wales. In Tudor times, hammers and wedges were used to break new ground, assisted by the process of fire setting. This involved lighting a fire against the rock surface to heat it, followed by rapid quenching with water or vinegar. The state of the underground workings can only be imagined, with the smoke that would have been generated by the fires making the tunnels almost unbearable. Quicklime was also used. It was put into holes drilled in the rock, followed by water. The hole would have been rammed tight with clay, and the miner would hope that the expansion of the lime as it hydrated would break the rock, rather than just push the clay plug out. Gunpowder seems to have been introduced for mining by Dutchmen in the 17th century. Miners would hand-bore holes using drills and hammers, usually up to two feet deep and about one inch across. These would then be charged with powder, and a long thin metal "pricker" would be passed down the hole, communicating with the main charge. The hole would then be rammed with clay, the pricker would be pulled out, and lengths of straw or reed full of fine powder would be put down the resulting narrow hole to act as fuse. Touch paper, which is paper soaked in saltpetre, would be fixed to the end of the straw, then the miner would light it and run. It was a much more effective way of mining than the old method, which was discontinued. This rather dangerous method continued until about 1870, when safety fuse was introduced. This consisted of a tarred rope with a core of powdered gunpowder. It burned at a fixed rate, which would give the miner a good chance of getting away. Prior to that, it was not unusual for a charge to explode prematurely, blowing the miner's eye out, or worse. Hand boring continued for about 300 years, but rock drills were introduced about 1890, reducing the labour considerably. However, they caused a lot of dust which the miner would inhale. Many died from silicosis, and the early drills were called widow makers. It was thought that the effects of dust could be minimised by growing beards to trap it. That explains why many of the old miners had magnificent specimens on their chins. The problem was not overcome until drills which used a jet of water to keep the holes wet were introduced. Unfortunately for the gunpowder industry, dynamite and similar explosives proved to be a much more effective at breaking rock. They explode with great violence, giving a much more powerful shockwave than gunpowder does. A stick of dynamite on a railway line would probably cut the metal, while gunpowder would do little damage. However, it is the relative gentleness of gunpowder which causes it still to be used where intact blocks of rock are needed, as in the state quarrying industry. Gunpowder was used in coal mining, but it suffered from the severe disadvantage that it could set fire to methane, or fire damp, which occurred in the mines. This would cause catastrophic explosions. A material called Bobbinite was permitted for use in coal mines until 1931. It included a material called Maizite, which looked like rice. That component reduced the risk of igniting gas. They were shaped like long cotton reels so that a shot hole could be charged and a fuse passed down the middle. They were packed in special brown paper, four to a pack. Presumably that was the normal charge for a shot hole. It is not my intention to devote these pages to a description of the uses of gunpowder in pyrotechnics. Suffice it to say that gunpowder still has an honoured place in that branch of the arts. Although it was the explosive used in bangers and the like, it has been largely superseded in that role by more powerful flash powders, which use metals such as magnesium or aluminium as fuel. However, it is used for lifting charges in mortars, as used to fire shells at larger displays, and for bursting charges in shells and rockets. It also occurs in various pyrotechnic mixtures. The real problem with gunpowder is that it contains sulphur. That material gives very friction-sensitive mixtures with some other firework components, particularly those for producing colour. It is courting death to mix them together. Certainly, weed killer and sulphur is extremely hazardous. All firework factories have a rigid separation between areas for mixtures containing sulphur and those that don't. Article reproduced by kind permission of Michael Baldwin. NB The first titles are on sale at the Fleur de Lis Heritge Centre in Faversham, which also stocks a wide range of other books on the history of explosives. A History of Fireworks, A. St. H. Brock, Harrap (1949). Chemistry as applied to the arts and manufactures, William Mackenzie, London, Circa 1885. Chambers encyclopedia of universal knowledge, William and Robert Chambers, London and Edinburgh, (1890). The old gunpowder factory at Glynneath, Pritchard, T., Evans, J., and Johnson, S., Merthyr Tydfil and District Naturalists' Society, (1985). Mining in the Lake Counties, Shaw, W.T., Dalesman Books (Clapham) (1983) ISBN 0 85206 2910.